In the Canyon, we have three species of scorpions. 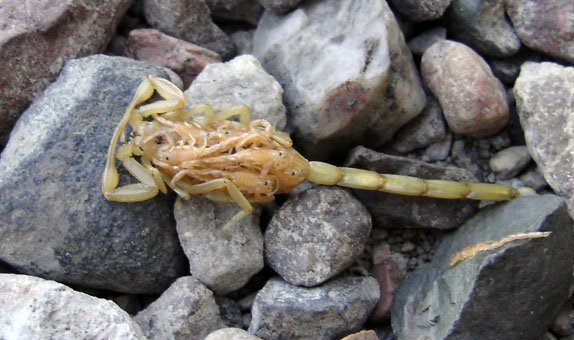 The centruroides is the most common scorpion to be found here, as well as the most dangerous. Also known as the bark scorpion, they are pale and small, making them extremely difficult to see. Scorpions eat insects and will only sting to protect themselves. They really aren’t “after” you. To prevent getting stung by a scorpion, it is a good idea to know where there favorite hang-outs are and when you are most likely to encounter them. Scorpions are nocturnal, meaning they are active at night. 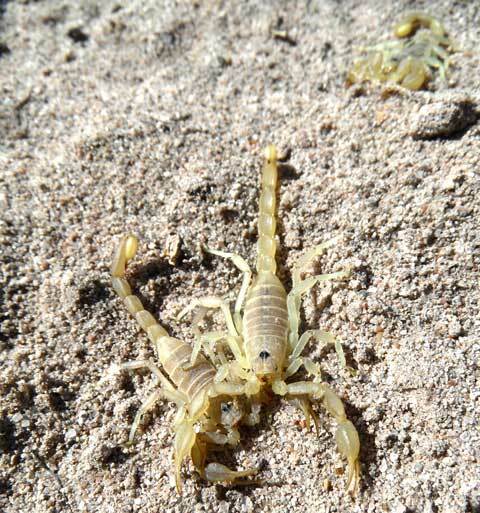 To find out specific information on scorpions, check out the Desert USA website. From their site, I quote this section on venom. “The venom of scorpions is used for both prey capture and defense. Scorpion venoms are complex mixtures of neurotoxins (toxins which affect the victim’s nervous system) and other substances; each species has a unique mixture. Despite their bad reputation, only one species in the U.S. and about 20 others worldwide have venom potent enough to be considered dangerous to humans. One of the most unusual characteristics of all scorpions is that they fluoresce, or glow, under a black light. If you attend an evening program at Phantom Ranch, the rangers will often take a black light after the program and show anyone interested just how many scorpions are hanging about. You will be surprised to see that the actual size of the scorpion is generally about 1½ inches long. That makes it a lot tougher to see, especially since it blends in the the ground so well! 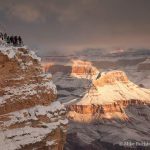 Something to keep in mind when you’re thinking of walking around barefoot in the Canyon! I have been personally stung twice by the centruroides, both times in buildings. Each time I was wearing very thick flip-flops, and the scorpion’s tail was able to reach up and strike me in the big toe. 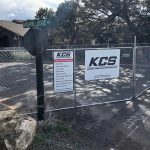 The first time I was stung was in the restroom at Canyon Lake, northeast of Phoenix, and the last time was in the ranger station at Cottonwood Campground on the North Kaibab Trail. And sure as I’m sitting here writing this, I DID NOT DIE! 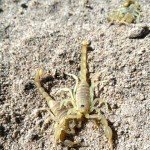 I found an interesting fact from Arizona State University; there has not been one documented death from a scorpion sting in the United States for more than 30 years! Yes, the sting certainly hurts. In fact, it made my leg tingle and ache for 24 hours! If you are allergic to bee stings, you have a right to be worried about anaphylactic shock from a scorpion sting, but then you should be carrying your EPI kit with you. But a normal, healthy adult is more likely to just get twitching and pain from the sting, as well as the possibility of becoming nauseous. People with compromised immune systems, elderly people, and infants are those most at risk of serious complications. In most cases, I believe that the fear is by far more dangerous than the actual sting. If you are stung, be smart and DON’T PANIC! Since the sting of a scorpion will cause your body to release histamine, it is often helpful to take antihistamine, the same stuff you take for allergies. Also, cool the site of the sting to slow the progress of the venom and allowing it to dilute in the blood before it gets to your heart. I used an ice cube placed directly on my toe, but cool creek water will do the same thing. If possible, find help with a medical professional as soon as possible.